Traffic lights are also known by many other names depending on which part of the world you are in. Other names include traffic signal, robot (South Africa), traffic semaphore, (older manual system) and signal lights. So, how much does a traffic light weigh? The weight of a typical traffic light will greatly depend on the material used for construction. Most traffic lights will be made from a polycarbonate material or cast aluminum, which helps reduce their weight. 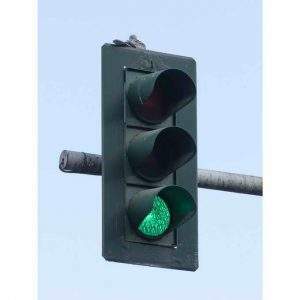 On average, a traffic light will weigh anywhere from 30 to 50 pounds (13 to 22 kg). There are normally two sizes of traffic lights depending on the lens size. They can either be 8 inches or 12 inches in diameter. A sun phantom effect is when you may misinterpret the actual color of the traffic light due to the light which is being displayed being in direct sunlight. To reduce this effect, you will see most traffic light colors having a visor sitting on top of them to help block the sunlight. The very first traffic light in the world was installed in 1868 in London and was gas lit. But, after only a month of being in use, it exploded, and the operator was injured. It was then back to drawing board. The oldest traffic light system is located in Ashville, Ohio. The traffic lights in that city were first installed way back in 1914. The reason why traffic lights use red, amber and green is because they were the colors first used on the railways. At the time it made sense to use the same system for the roads. However, the amber was not introduced until 1920.